Music theory is something many electronic music producers find challenging – and hey, I get it – even with a basic understanding of music theory, I get confused all the time. That said, music theory is a skill set that is very learnable if you simply commit to it (especially if you’re creating western music, which you most likely are). The reality here is that a music producer who has some semblance of music theory training will essentially be a more effective music producer. That producer has more weapons to work with in his arsenal. It doesn’t matter if it’s for EDM (Electronic Dance Music) or for any other genre, producers who have learned these skills are disciplined. They do not doubt their ability to come up with new material because they don’t view it as contingent on chance. It’s something they are trained to deal with. Above all, that is the main benefit of learning the intricacies of music theory. So what if you aren’t there quite yet? How do you catch up? How can you write memorable, meaningful and beautiful compositions? Any online music theory course will present the same exact information in their course as what is in this article, albeit with some additional examples and exercises to work through. And with a little additional digging, some practice, some fundamental music theory, and a few modern-day music theory hacks, you’ll be well on your way to learning the necessities of music theory for computer musicians. at the bottom of this article. Otherwise, keep reading! Let’s start with the basics and talk about music theory for piano. Piano is the most important instrument to grasp because every DAW uses a piano roll for your midi and composition editing. This is applicable beyond piano, but again, this is the most common instrument used to learn the basics of music theory. 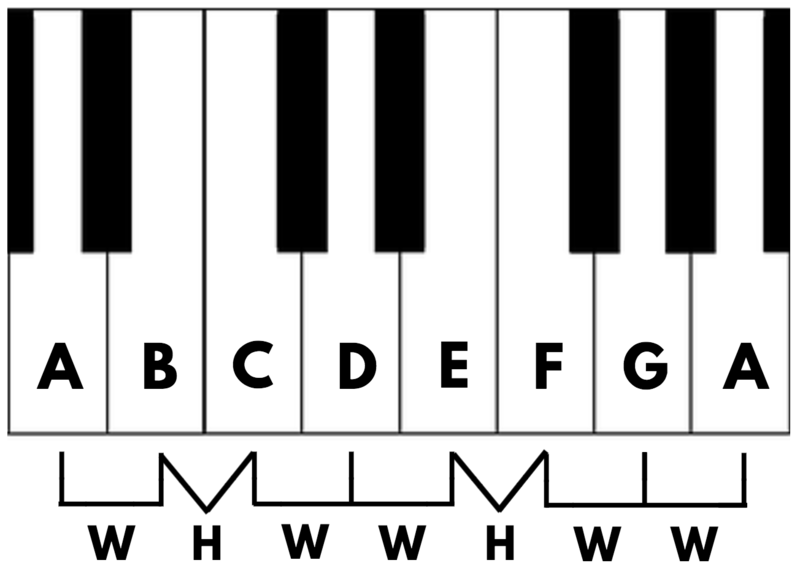 The white keys on your keyboard play the “natural” notes in a scale (C, D, E, F, G, A, B). Playing just on the white keys puts you in either the key of C major or the key of A minor. The black keys on your keyboard play all the sharp and flat notes (C#, Eb, etc). By incorporating the black keys on your keyboard, you open up the possibility to write in additional keys other than C major and A minor. An interval is the distance between two notes. For our purposes, we’ll be talking about whole-step intervals (a whole step is the equivalent of two semitones) and half-step intervals (a half step is one semitone). Most common musical scales are based on whole and half steps. We will also be defining chords by using whole and half steps, so it’s important you learn this now. Major scales carry a more light, happy emotional feeling, with most of the emphasis in the key placed on major chords. Minor scales can carry a darker, more melancholic feeling, but can also incorporate a more uplifting feeling as well. The majority of current popular music (EDM, pop, rock, etc) is written in a minor key. Minor keys place more emphasis on minor chords. A major chord consists of a root note, a second note that is 4 semitones higher than the root note (or 2 whole steps), and a third note that is seven semitones higher than the root note (or 1 and a half step above the second note). A minor chord consists of a root note, a second note that is 3 semitones higher than the root note (or one and a half steps), and a third note that is seven semitones higher than the root note (or two whole steps above the second note). Roman numeral analysis uses Roman numerals to represent chords. The number of the Roman numeral indicates how many intervals the root note of the chord is above the tonic note of the key; additionally, a capital Roman numeral indicates a major chord, and a lower case Roman numeral indicates a minor chord. 9ths follow the same rule, but with the addition of the note 9 intervals above the root note of the chord. Different types of ninth chords can also include the 7th, and other notes. Now that you know how to build out major and minor chords, as well as create inversions, 7ths and 9ths, a chord progression is simply how you jump from one chord to another, or a succession of musical chords. Chord progressions are usually the foundation to most melodic compositions. Even if you start the composition process with something other than a chord progression, you’ll still eventually want to match your melody or hook to a chord progression. There are some styles that might be an exception to this rule, but that is rare. 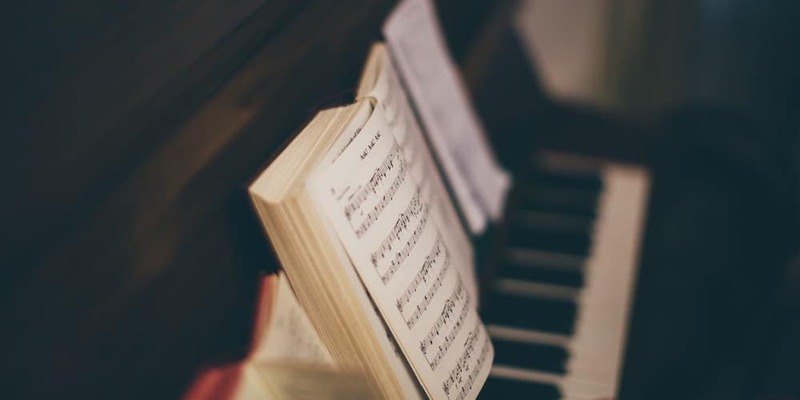 What’s interesting, however, is that you cannot copyright a chord progression – so feel free to use existing songs as a form of inspiration or to simply help spark your creativity when writing. For now, let’s get a basic grasp on using chord progressions in your music. Obviously there is an absurd amount of chord progressions not listed here, but if you are unfamiliar with building out chord progressions, start by re-creating this list so you can familiarize your ears and experiment from there. For more on chord progressions, jump to the Unison MIDI Pack at the bottom of this article. A key change means the usage of a new key for a certain part of a song. This is relatively rare in pop music, but if done correctly can create a strong emotional shift in a composition. Key changes are more common in classical music. A “borrowed chord” is a chord that typically lies outside of a given key, but is taken from a parallel key. 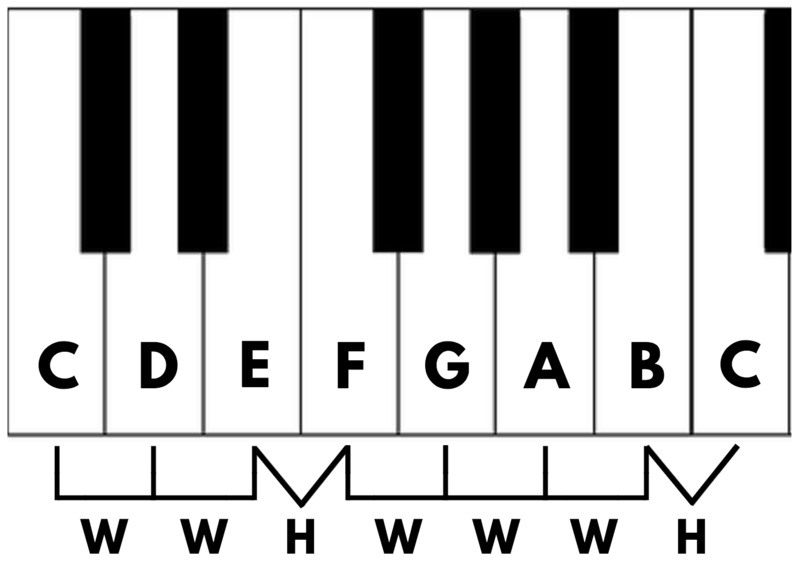 A parallel key uses the same tonic note, but is a different type of scale (for example, C major vs C minor). So, with this example, a chord which exists in the key of C minor but not in the key of C major could be used as a “borrowed chord” in C major. A Secondary Dominant is the dominant (V7) chord that has the strongest pull to any chord in a scale other than the root. To clarify, in any given key the root is the I chord and the dominant is the V7 chord. In the key of C, the root is C and the dominant is G7. So, to figure out the secondary dominant of any chord within your scale you can ask yourself what would be the V chord of the scale if the chord I’m choosing were in fact the root. If you’re writing in C and wanted to figure out the secondary dominant chord for Am (vi in C), all you need to know is that is the V chord in the key of Am. In the key of Am the V chord is E. Make that into a dominant 7 chord and you’ve got yourself the secondary dominant E7. These are really useful because we know that the V chord has a very strong pull to the I chord. The V7 chord has an even stronger pull to the I. So using the correct secondary dominant chord as a transitionary chord to any chord within your key can have a very dramatic and musical effect. For further clarification click here.  There are tons of awesome resources online to help you come up with chord progressions, analyze songs you like, and essentially “hack” music composition without a music theory background. But, at the end of the day, there is no substitute for a strong understanding of music theory, and putting in the effort to improve your music theory knowledge will only help you write more compelling compositions. As someone who took a lot of pride in originally writing all of their own chord progressions from scratch, I couldn’t believe that no one cared, noticed, or tried to arrest me when I first used a chord progression I built using an online tool like Hookpad. Letting go of this idea that I had to do everything from scratch opened up my creativity, saved me time, and allowed me to experiment with progressions outside my comfort zone. If anything, it made me better at music theory. This is exactly why, when I learned that one of my former Masterclass students founded a sample pack company called Unison, and had put out an amazing MIDI Pack, I was pretty damn intrigued. Once I got my hands on it, I was blown away – I could bypass other midi packs and online services like Hookpad all together, because the pack contains essentially every chord you’d ever want to use. Complete with triads, inversions, extended chords, borrowed chords or even full-on progressions. It’s literally the perfect midi-pack, something I wish I had created for myself years ago to make the composition process significantly easier. See for yourself below, I recorded a quick, genuine review of the Unison MIDI Pack, and even built out a chord progression and the foundation of a song in under a minute. Normally, this midi pack sells for $67 – but since you are a Hyperbits reader (or subscriber, student, etc.) you can get 60% off of this pack. That means that for $27, you can make writing chord progressions an absolute breeze. Whether you consider yourself a beginner at music theory or more advanced at music theory, this pack will dramatically improve your composition workflow, and make things a lot easier for yourself. And again, as someone who is pretty good at music theory, this pack has actually helped me hone my craft. This pack isn’t a complete catch up solution if you are struggling with music theory and chord progressions, but it’s pretty damn close. I’d make the argument that for only $27, this pack is worth more than any music theory course (something like music theory for dummies) you’ll find yourself working through. In the end, I’d do both – I’d get this pack and brush up on my music theory skills as well, because the skillset of music theory will only help in the end, and would compliment your creative process perfectly. Enjoy the pack and enjoy the discount! What about you, what do you think? Do you need to learn music theory to produce electronic music? Let me know in the comments below.